Garrett M. Graff is an editor at the Washingtonian magazine, where he covers media and politics, edits the Capital Comment section, and serves as internet director. His first book, “The First Campaign: Globalization, the Web, and the Race for the White House,” was published in December 2007 by Farrar, Straus and Giroux. He teaches graduate-level internet and social media at Georgetown University. 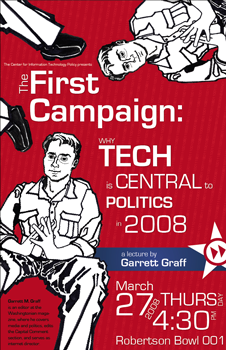 From the first speeches, the 2008 presidential campaign has been shaped by technology at every level—from the candidates speaking at Google headquarters about the need for innovation in the 21st Century, to viral campaign ads zipping back and forth on YouTube. What makes this election a particularly transformative one? How will the next president value tech policy and the increasingly interconnected issues of the economy, trade, technology, and education?